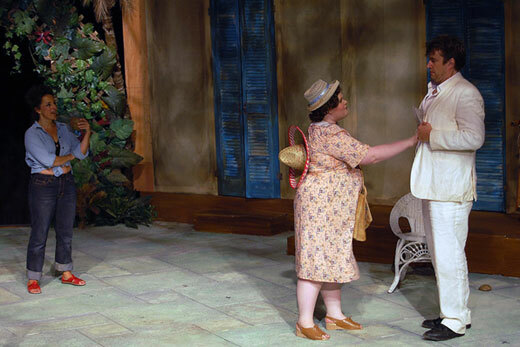 Agnes Harty, Emma Calabrese, and Robin Bloodworth star in "The Night of the Iguana," the first production for Theater Emory of a full-length play by Tennessee Williams. Photo by Scott Wile. Theater Emory presents "The Night of the Iguana" April 5-7 and April 11-14 at 7 p.m. and April 15 at 2 p.m. in the Mary Gray Munroe Theater, Dobbs University Center at Emory University. Tickets $20; discount category members $16; Emory students $6. More information online at www.arts.emory.edu or by phone at 404-727-5050. Free parking is available in the Fishburne and Peavine parking decks. In its 30 years of existence as Emory's resident professional theater company, Theater Emory has never tackled a full length Tennessee Williams play, until now. This year marks the national centennial celebration of Williams' birth as well as a major first for Theater Emory, with the production of Williams' 1961 Broadway hit, "The Night of the Iguana," April 5-15 in the Mary Gray Munroe Theater. "This play is a beautiful gem that often gets passed by for production yet it stands equal to all of his brilliant plays," explains John Ammerman, artistic director of Theater Emory. "It is great to conclude our season by celebrating this brilliant American playwright." Set in 1940s Mexico, the play opens with the arrival of recently disgraced Rev. T. Lawrence Shannon at a cheap hotel on the coast. Accompanied by a tour group composed of hostile women and dealing with considerable emotional distress, the reverend's situation becomes even more chaotic with the proprietor of the hotel's carnal advances and the arrival of the innocent spinster Hannah Jelkes. "In 1940, Tennessee Williams fled to a humble hotel near Acapulco, Mexico to escape from the trauma of the demise of an important personal relationship," explains Director Janice Akers. Theater Emory's production design aims to recreate the coastal Mexico Williams describes in his diary, a little haven where jungle meets sea. However, just as the reverend's interior world is battered by tempests, the peaceful oasis transforms violently when sudden tropical storms erupt. For the cast and crew of "The Night of the Iguana," creative forces blow through like the gusts of a volatile climate. Explains Akers, "We have been focusing on the three storms of the play: the internal turbulence of the characters, the upsets in the natural world, and the looming political storm of the Nazis firebombing London in September of 1940. The design, the acting choices, and the actions are all developed in reaction to these powerful forces." The production is Theater Emory's 2011-2012 "Bloody, Breathless, and Bold" season finale.